I know I told y’all that I don’t drink smoothies very much, and now here I am posting all of these smoothie recipes. Whoops. I guess you really can’t believe everything you read on the internet! I guess if it’s a smoothie bowl, it’s different. Because, you know, toppings. I think our culture has a slight obsession with ALL the toppings on everything. I’m kind of okay with that. Toppings make everything prettier, and used the right way, can make a simple breakfast bowl even more healthy. 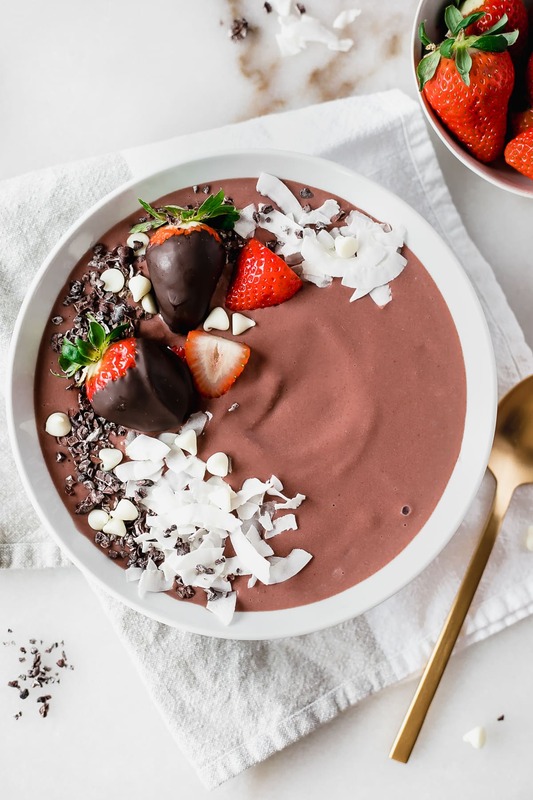 They’re a great way to add in extra fruit, seeds, nuts, and chocolate covered strawberries, that boost the nutrition in your breakfast or snack. 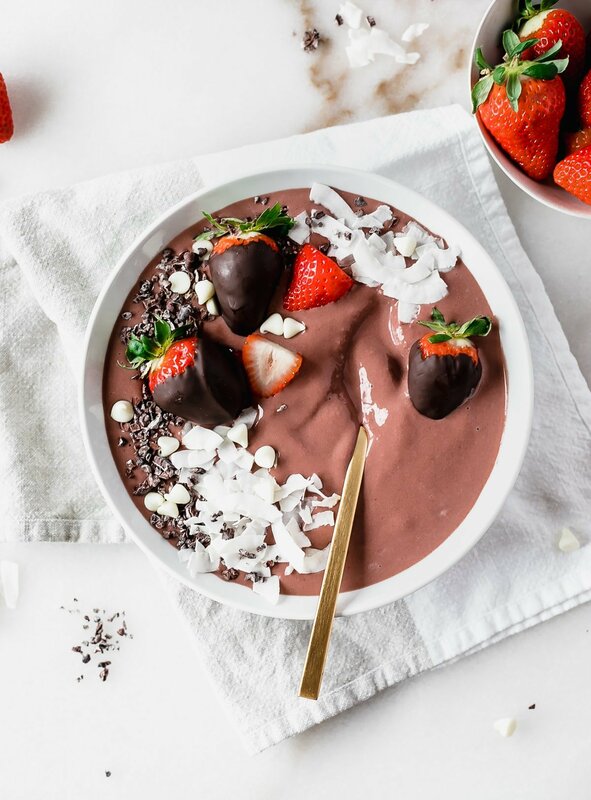 Ok, maybe that last one isn’t a normal healthy topping, but the chocolate covered strawberries totally make this chocolate strawberry smoothie bowl. Who doesn’t love chocolate covered strawberries? And who wouldn’t want to eat them for breakfast?! A crazy person, that’s who. If somebody tells you they don’t want chocolate covered strawberries for breakfast, RUN AWAY as fast as you can! 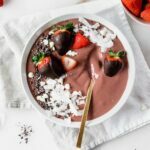 Besides the amazing toppings, this smoothie bowl has a super simple and delicious strawberry base of just 4 ingredients. That’s it. Strawberries, yogurt, milk, and honey. Done. 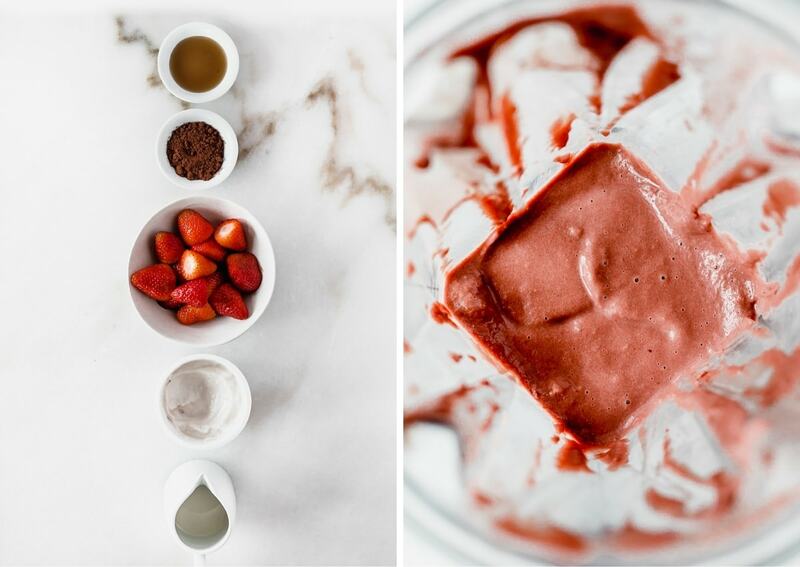 The frozen strawberries make an extra thick and frosty base, while the yogurt makes it extra creamy and protein-rich. It couldn’t be any easier! 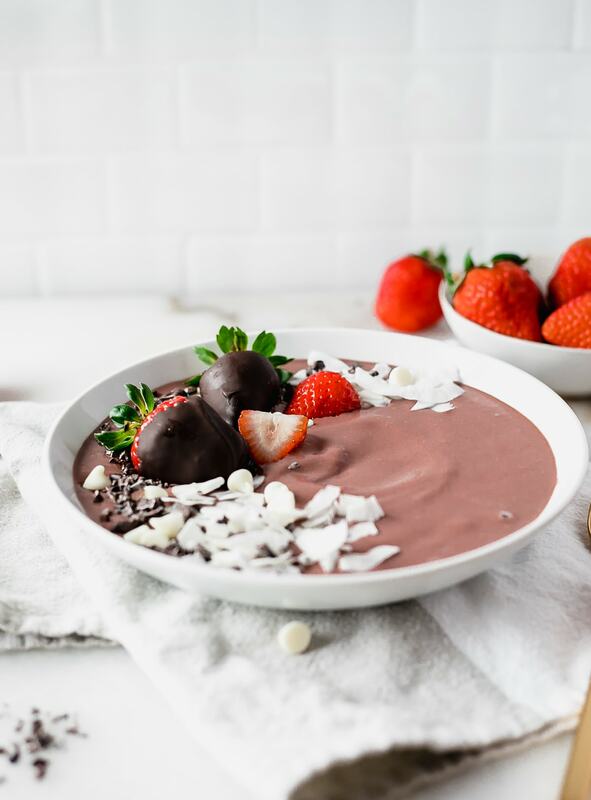 This chocolate strawberry smoothie bowl is a great way to start (or end) the day on a sweet, healthy note. It would make a great Valentine’s Day breakfast, too! Chocolate covered strawberries (not) optional. Blend all ingredients in a high-powered blender. You may need to add more milk to reach your desired consistency. Pour into a bowl and top with your favorite toppings. Enjoy! To make chocolate covered strawberries, melt dark chocolate chips in a small microwaveable dish. Dip strawberries and place on waxed paper or parchment and let sit in the refrigerator to harden. Nutrition calculated with 1 tsp honey.